: Cocker Spaniels were recognized as a separate breed from Field and Springer Spaniels soon after the formation of the Kennel Club in 1873. He originated as the ‘cocking spaniel’, and derived this name from flushing woodcock. 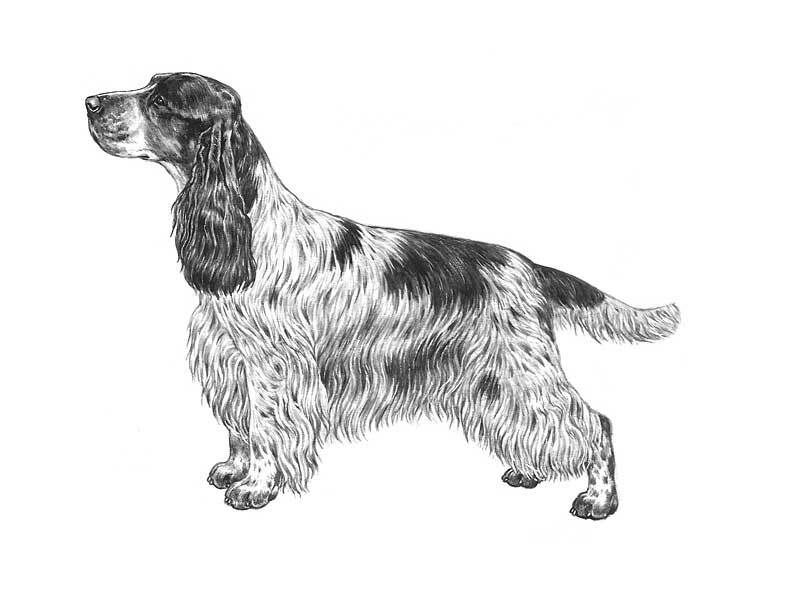 As with a number of gundog breeds there is nowadays a difference between those used for work and those used for show the show Cocker is a sturdier, heavier version of his working counterpart. : Merry, sturdy, sporting; well balanced; compact. : Measuring approximately the same from withers to ground as from withers to root of tail. : Merry nature with ever-wagging tail shows a typical bustling movement, particularly when following scent, fearless of heavy cover. Gentle and affectionate, yet full of life and exuberance. : Well developed, cleanly chiselled, neither too fine nor too coarse. : Distinct, set midway between tip of nose and occiput. : Sufficiently wide for acute scenting power. : Full, but not prominent. Dark brown or brown, never light, but in the case of liver, liver roan and liver and white, dark hazel to harmonize with coat; with expression of intelligence and gentleness but wide awake, bright and merry; rims tight. : Lobular, set low on level with eyes. Fine leathers extending to nose tip. Well clothed with long, straight silky hair. : Firm, level, gently sloping downwards to tail from end of loin to set on of tail. : Well developed and brisket deep; neither too wide nor too narrow in front. Ribs well sprung. : Set on slightly lower than line of back. Must be merry in action and carried level, never cocked up. Previously customarily docked. : Legs well boned, straight, sufficiently short for concentrated power. Not too short to interfere with tremendous exertions expected from this grand, sporting dog. : Wide, well rounded, very muscular; legs well boned. : Short below the hock joint, allowing for plenty of drive. : Flat, silky in texture, never wiry or wavy, not too profuse and never curly. Well feathered forelegs, body and hind legs above hocks. Solid colours Black; red; golden; liver (chocolate); black-and-tan; liver-and-tan; No white allowed except a small amount on chest. Particolours Bicolours; Black and white; orange and white; liver and white; lemon and white. All with or without ticking. Tricolours Black, white and tan; liver, white and tan. Roans Blue roan; orange roan; lemon roan; liver roan; blue roan and tan; liver roan and tan. Females 38 - 39 cms.